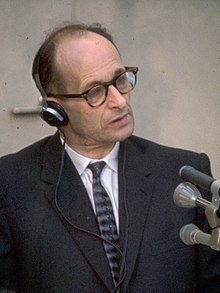 Naitsíoch agus SS-Obersturmbannführer (leifteanantchoirnéal) in Arm na Gearmáine ba ea Otto Adolf Eichmann (19 Márta 1906 – 1 Meitheamh 1962). Bhí sé ar phríomheagraithe an Uileloscaidh le linn an Dara Cogadh Domhanda. In Solingen, sa Ghearmáin a rugadh é. D'éirigh le hEichmann éalú ag deireadh an chogaidh agus sa bhliain 1950 chuir sé faoi san Airgintín. Chaith sé 10 mbliana ansin faoin ainm bréagach Ricardo Klement. Fuair an ghníomhaíocht faisnéise Iosraelach Mossad amach cá raibh sé, agus sa bhliain 1960 d'fhuadaigh gníomhairí de chuid Mossad agus Shin Bet é.
Tugadh chun trialach in Iarúsailéim, Iosrael, é mar ar cuireadh coireanna cogaidh ina leith. Ciontaíodh agus daoradh chun báis é ar 11 Nollaig 1961. Crochadh é ar 1 Meitheamh 1962 in Ramla, in Iosrael. Dúirt Eichmann tráth go mbeadh sástacht iontach air "ag léim isteach san uaigh" dó agus bás 5 mhilliún duine ar a choinsias. Tugadh an leathanach seo cothrom le dáta an 13 Deireadh Fómhair 2018 ag 08:23.